Valentine's Date Night Done Right! 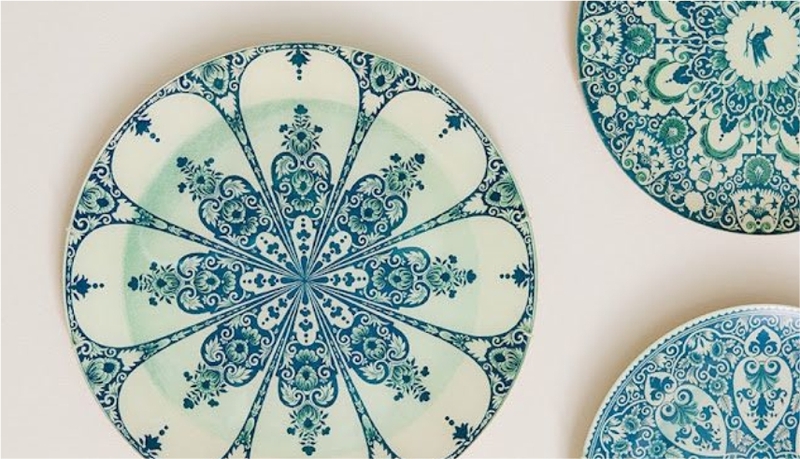 When we travel overseas, especially to places rich in history and culture, we are inspired to carry back the charm of those places through ideas that we can translate into the interiors of our homes. Arabic-inspired decor for example, brings with it influences which can be reflected in luxurious furniture, decorative tiles, exotic carpets, and enchanting lanterns. Bringing home this decor theme can be tricky because if you overdo it, you run the risk of having your home look like a souk! Every decor style, even when rooted in the culture of a country, needs to adapt to the interiors of modern, contemporary spaces. 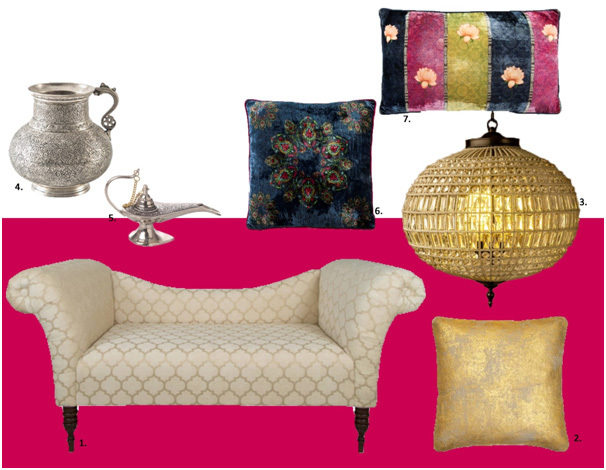 Here is how you can bring home decor ideas, inspired by the Arabian Nights, into your modern contemporary space. A Middle Eastern palette incorporates a varied range of warm and cool colours. Bright pink, purple, orange and turquoise are the most widely used colours. A good way to begin introducing this look into your home is by first incorporating elegant shades – white, beige and shades of gray will provide a neutral backdrop against which bright, bold accents will give your home a modern, chic appearance. 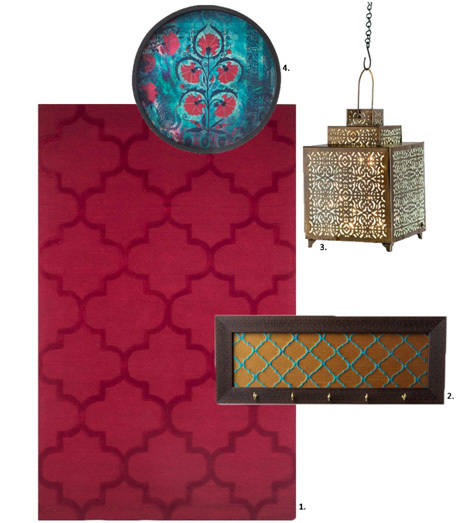 Mix warm and cool shades - Moroccan Red and Turquoise for example - for a bold and elegant look. A wall with turquoise textures works beautifully with red furnishings, such as this Moroccan carpet. We have also chosen a turquoise tray with a red floral pattern, and a key holder with a hint of turquoise, as additional examples. Add gold accents in the form of accessories that includes opulent lanterns, or a vase to lend an exotic touch to the decor. Discern Tip: Use sequined tie-backs for sheer curtains to create an atmospheric setting reminiscent of dreamy Arabian nights. 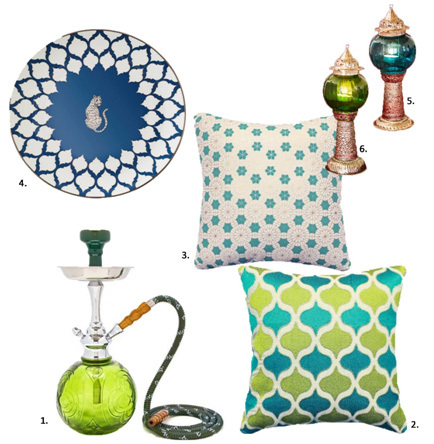 Middle Eastern-inspired style isn’t only about decorating with colours. You can achieve the same look in a plain white room by using furnishings that feature motifs and patterns inspired by their culture. Dress your home in plush satins, velvet, heavily embroidered textiles, and gleaming silks to create a sense of richness and a lounge-like atmosphere. Layering with different prints and patterns in varying colour schemes is an important element of this style of décor. Against this all-white backdrop, the trellis and star-patterned cushions introduce a delicate mix of colours. The circular trellis pattern on the plate and the colourful lanterns bestow a somewhat Moroccan charm to the decor. The hookah adds to the laid-back aura! Arabian décor is synonymous with a rich and luxurious setting. Use satin surfaces and intricate patterns to create an opulent effect. This wallpaper with an embossed pattern for instance, adds depth to the room. 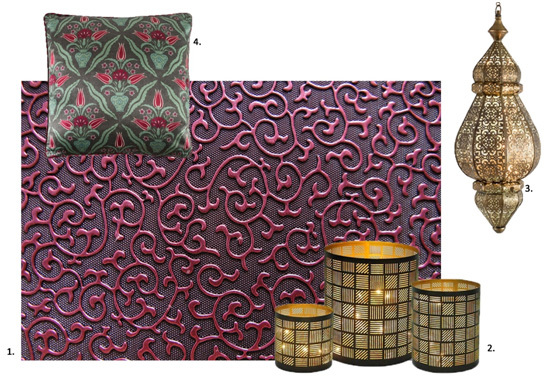 Blend Moroccan and Persian influences in your modern, contemporary space with motifs in rich purple, burgundy, blue and crimson. Let accents in gold amp up the glam quotient of your home. Discern Tip: Travelers curious about Arabian decor should not miss out on the fabulous Arab Street in Singapore, dotted with shops selling vibrant textiles, baskets, leather bags, perfumes and Persian carpets. The street is lined with many Middle Eastern cafes too. Extravagant rosewood, walnut and cherry wood furniture in elaborate designs, while mostly traditional in style, have found their place in the contemporary style of decor. We recommend this mood board for a room in which you're looking to create harmony between the traditional and the modern. Place the wooden beige sofa in a Trellis pattern against a vivid pink wall to achieve this effect. The Moroccan chandelier is our chosen luxe accessory, while the velvet and silk cushions with Persian motifs, the silver vase and the lamp add to the charm. If you are ready for a change in your home decor, you may want to try out this richly decadent style. Tell us how it worked for you on Twitter and Instagram @DiscernLiving.